Yellow Bishop, Range-change map between SABAP1 (1987-1991) and SABAP2 (2007-current). 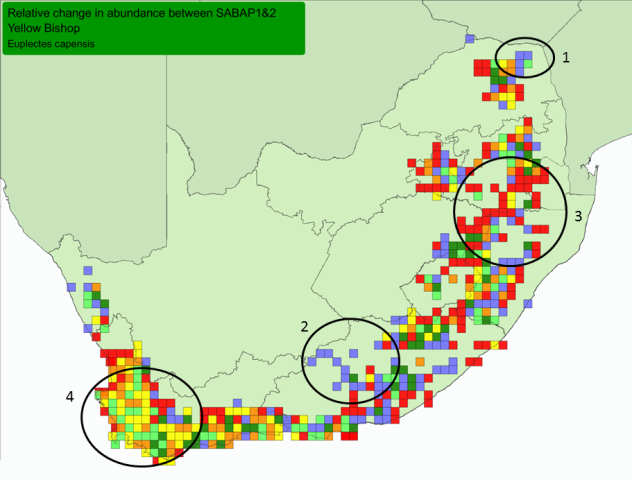 In South Africa the Yellow Bishop has more grid cells with decreases in reporting rate than cells showing increases, between SABAP1 (1987-1991) and SABAP2 (2007-). 1. Limpopo Province - slight range expansion northwards. 2. Interior of the Eastern Cape - range expansion westwards. 3. Southern Mpumalanga and northern KwaZulu-Natal - occurs at low reporting rate and decreasing. 4. The Yellow Bishop occurs at a relatively high density in much of the Western Cape and this population appears to be stable, i.e. shows mostly small increases (light green) or small decreases (yellow). Mozambique - new records from far north coast (SAFRING database).